CPM Student TutorialsCPM eBook SupportStudent: CPM eBooks (Student Version) Other Devices with eBookseBook: How Do I Translate English Text Into Another Language? This tutorial describes how you can quickly get a translation of a selection from the CPM eTextbooks using Goggle Translate. 1. Highlight text from any lesson of the CPM eTextbooks that you want translated. 2. Go to your browser&apos;s top menu bar. Select Edit --> Copy. 3. Click the "Translate" button on the on the lower bar of your ebook. 4. Choose the translation language from the pop-down menu. 5. Finally, select the white box by clicking it. 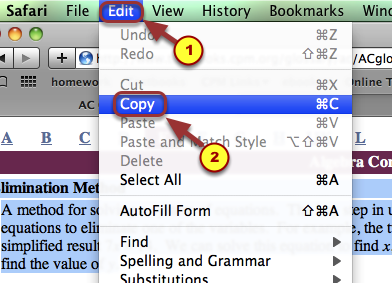 Then paste the copied text into the box. The translation will appear to the right of the English version. You can also click on any translated sentence to see the English version. Prev: How do I get the PDF Resource Pages to print to scale?